Recorded in Bathsheba on the wild east coast of Barbados. Every nightfall is celebrated by a chorus of a million whistling tree frogs (Eleutherodactylus johnstonei), singing over a background of palm trees rustling in the wind, and the distant drone of the Atlantic Ocean. These tree frogs are tiny – on one night, I crawled around on a field with a flashlight, trying to find the frog that I heard whistling directly in front of me, but without success. The incessant, almost static, quite loud sound tapestry woven from ocean, wind, cicadas, and the pointillist tone cluster of the whistling frogs, going on for hours every night, conveyed to me a strong sense of timelessness. 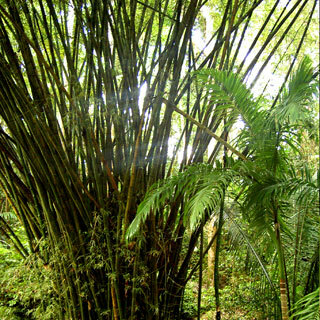 Very large specimen of these magnificent bamboo trees can be found in many places on Barbados. Even on a moderately windy day, such a bamboo produces a wide range of sounds, from piano (leaving space for the occasional birdsong or frog whistling) to a sudden fortissimo, turning the bamboo stems into a clattering, rustling, squeaking percussion orchestra. This one was recorded in a magical tropical garden called “Flower Forest”. During the recording, I was drinking coffee while watching green monkeys having lunch in the top branches of a giant breadfruit tree. 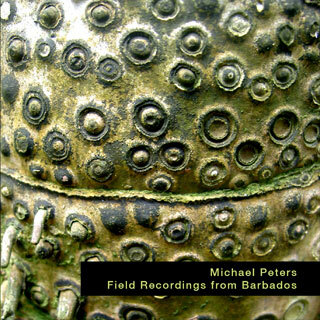 […] Michael Peters’s Field Recordings from Barbados is a very different proposition. Rather than Carlyle’s tightly framed snapshots of acoustic atmospheres, he presents two 25 minute tracks, one of giant bamboo moving in the wind, the other of whistling tree frogs. Duration is integral to the effect. Little changes on the surface, although of course the sounds are constantly shifting, with the leisurely pace of minimal electronic work of such artists as John Hudak. After a while the trees and frogs no longer sound like trees and frogs: all is a miasma of interlocking repetitive patterns. The play between stasis and variation draws you back to these recordings again and again. The only thing I know about Barbados is what I learned from ’24 Hour Party People‘: no heroin but plenty of crack – its not the isle of man. Surely not the reason why Micheal Peters went there in 2004 to make these two long field recordings. In the liner notes of ‚Giant Bamboo‘, Peters says he was drinking coffee, which is a long shot away from the Happy Mondays. Both pieces are self-explanatory. In ‚Giant Bamboo‘ he recorded a bamboo tree, along with some green monkeys having lunch, whereas in the opening piece ‚Whistling Tree Frogs‘, he recorded a chorus of ‚a million tiny whistling tree frogs‘, singing in palm trees, along with wind sounds and sea waves of the Atlantic Ocean. As simple and clear as that. Both pieces have the exact same length, which I thought was quite odd, and are at their best ambient music pieces – sound that surrounds you in your environment. A very fine CD and one that satisfied me more than his recent ‚Impossible Music‘ release (see Vital Weekly 665). Finally today, the dictionary defines music — in part — as „the art of arranging tones in an orderly sequence.“ You don’t always need instruments to do that. Sometimes nature does the job — without human intervention. And Michael Peters likes to record the result. Peters is a musician living in Cologne, Germany. He recently went on vacation to Barbados — in the Caribbean — and took along his microphone. 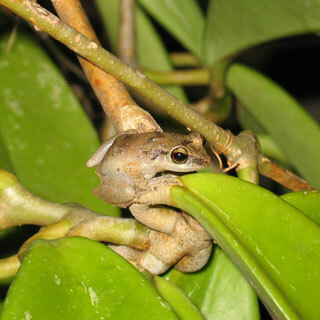 track one, clocking in at just over 25 minutes, captures whistling tree frogs in Bathsheba on the east coast of Barbados. Recordings of ‘nature’ very often end up falling into either the scientific camp or the tree-hugger idea of what the natural world is – you know, it’s all very warm and the animals are our friends etc etc. Michael’s recordings escape those traps by their sheer visceral quality. The length of this audible onslaught (25.21) takes the listener into an experience that renders the environment a puzzling and strange place, which is after all the truth of the matter. The second track features the sounds of giant bamboo trees being moved by the wind. The recording also captures various animal, insect & bird sounds of course but it is by focusing on the sounds of the trees themselves that one can appreciate the track in full. Anyone who has stood amongst a reasonably sized group of trees and listened to the veritable symphony that emerges from their movements will know just how varied the sounds can be. Again the length of the track (also 25.21) is of importance. If the track were 5 or 10 minutes long it would simply be a documentary recording of the environment but here we can listen past the initial interest in the specific sounds and allow the landscape to emerge on its own terms. […] Gruenrekorder is a good label & anyone with an interest in field recording will no doubt find both of these releases well worth purchasing. I recommend them both – buying a cd should never be about only buying work that one is 100% sure of anyway – we only learn about anything through trial & error. Only that way can we begin to enjoy things that are specific to our individuality – only then can we appreciate aspects of work that doesn’t tick all our boxes & that, in this context, is where ‘respect’ for others work originates.